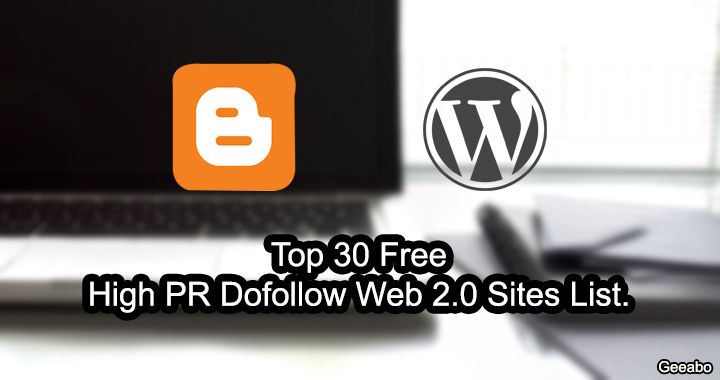 This article of Geeabo teaches you about Top 30 Free High PR Dofollow Web 2.0 Sites List 2018. Friends, Web 2.0 Sites are the very high quality sites. If you can get back-links from these high pr sites then no one can stop you in getting high results from search engine. Guys as you all know that search engine gives value to only dofollow links. No-follow links are also good but search engine not gives value to them. So, if you can get dofollow links from these web 2.0 sites, then this is your big success in the online world. Web 2.0 Sites are those sites which gives more and more value to user generated contents. Web 2.0 does not refer to an update to any technical specification, but to changes in the way Web pages are designed and used. In other words, The sites which has a very large number of traffic and so many users are connected through it to publish contents, photos, etc. like – Twitter, Pinterest, etc. are called Web 2.0 Sites. Top 20 High PR Instant Approval Directory Submission Sites. Try to get links from these web 2.0 sites. So this was the Top 30 Free High PR Dofollow Web 2.0 Sites List 2018 to increase your blog ranking. Which is the Best SEO Friendly URL Structure in WordPress. Latest WordPress Ping List For Fast Indexing Of New Post. Thanks for the Comment, Jahanzaib! Thanks for sharing, and can I make a few recommendations to the post. Thank you brother, for sharing high authority website list. Thanks for the comment, Ban! Your post is very nice and informative. Thanks for the comment, Fakhruddin! If I’ve added the links of the site on the listing, how much traffic can I generate in return, please let me know? These links do not give you traffic. After adding the link of your site to these listings, they will check your link. Chances are they accept or reject your link, if your link accepted then it helps you to increase your domain authority, off page SEO, etc. And if rejected then you should try on some another listing related to your site’s niche. Please tell us in detail that how to get the backlink from these type of website. Suppose you want to add your link at Weebly. So for this, you have to create a free website on Weebly and then you have to write an article and between the article, you have to place your website’s link on which you want to get the backlink. If you have still any question or suggestions then feel free to ask me. Thanks for the comment, Rahul!